Arcadia Publishing (SC), 9780738562780, 127pp. Nestled behind the Endless Mountains in Luzerne County, the rolling hills of the Back Mountain are a scenic blend of Pennsylvania's natural beauty and history. Adjacent to the anthracite coal regions of Luzerne and Lackawanna Counties, the Back Mountain includes Kingston Township, Trucksville, Shavertown, Dallas, Huntsville, Lehman, and Harvey's Lake. Historically the area offered many forms of recreation and entertainment, which brought tourists from all over the Northeast. Harvey's Lake is the largest natural lake in Pennsylvania, and it became a major resort destination in the early 20th century. 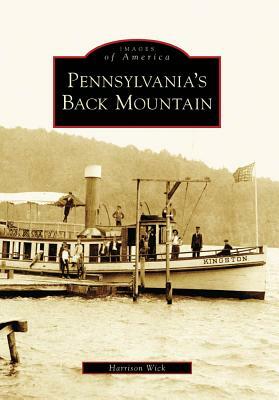 Pennsylvania's Back Mountain is a compilation of rare photographs documenting this historic community and revealing a bygone era of amusement parks, hotels, railroads, and steamboats.